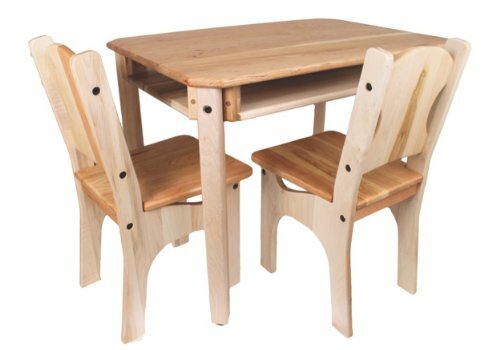 A charming solid wood children's table and two-chair set. Ideal for coloring, painting, reading and eating. Perfect for children when playing with blocks and puzzles, eating lunch and snacks or to use as a play fort or set up a nature table. The under-table shelf provides ample storage for supplies. Specifically designed and styled for children up to age 12. Each chair seat and back is crafted from solid cherry wood. The chair frame and table legs are crafted from solid maple wood. Table: 22"w x 33"l x 24"h Chairs: 12.5"l x 27"h x 14"w , seat 14"h. Each chair has a 100-pound weight capacity. It is finished with Three BEEautiful Bees Original Wood Polish. Ships to the continental USA only. Some assembly required. Table: 22"w x 33"l x 24"h Chairs: 12.5"l x 27"h x 14"w , seat 14"h.
Finished with Three BEEautiful Bees Natural Beeswax polish. Materials: Cherry and Maple hardwood. Ships to the Continental USA only; some assembly required. If you have any questions about this product by Camden Rose, contact us by completing and submitting the form below. If you are looking for a specif part number, please include it with your message.